Female; Must possess a Bachelors’ Degree major in Accounting / Accountancy; Experience in Finance and Accounting work is an advantage; Computer literate especially in MS Office Applications; With good oral and written communication skills; Can work under pressure and minimum supervision; Fresh graduates are welcome to apply. Must possess a Bachelor’s / College Degree in Engineering preferably Electrical / Electronics and Communication; With at least two(2) years working experience in the related field; Ability to handle and manage production people; Knowledge of manufacturing concepts; Ability to grasp modern technology quickly; Must be good communicator; Ability to prioritize multiple projects; Experience on electronics and metal works is desirable; Experience in ISO9001 is desirable. Female; At least High school graduate; With or without experience; Service oriented. Female; Candidate must possess at least a Vocational Diploma / Short course Certificate; At least 2 year(s) of working experience in the related field is required for this position. Graduate of BS Accountancy; Must be a Certified Public Accountant (CPA); With or without experience; Can work with minimal supervision; Systematic, organized, and can work under pressure; With good moral character, hardworking and can work beyond normal working hours. Male; Graduate of BS Mechanical Engineer; Must be licensed Mechanical Engineer; Work experience in an automotive industry is an advantage but not required; Can work with minimal supervision; Systematic, organized, and can work under pressure; With good moral character, hardworking and can work beyond normal working hours. Male / Female; Graduate of Industrial Engineering, Mechanical Engineering or any related course; 1year experience and above in a manufacturing firm is an advantage; Fresh graduate are also welcome to apply; Must be computer literate; With good verbal and written communication skills; With strong personality; With good working attitude and moral character; Willing to work for long term and with minimum supervision. * Administrative Assistant – With Accounting background. Male / Female; Bachelor’s/College Degree holder, preferably in the field of Management or Psychology; Minimum 5 years work experience preferably from the industry of construction, logistics or mining; Extensive knowledge on Labor Laws, organizational Development, Conflict Resolutions and Documentations; Knowledge on MS Office; Adaptable to changes, organized and systematic excellent people skills. A High school diploma is preferred; Physical mobility and stamina required; Ability to follow instruction; Detail-oriented; Professional attitude is required. Female; Graduate of 4 years course of any related field; With experience in a manufacturing firm; Preferably with knowledge in HR procedures; Must be a self- starter in implementing safety policies; Must be able to handle pressure; Must be flexible and easy to train; Must be people oriented. 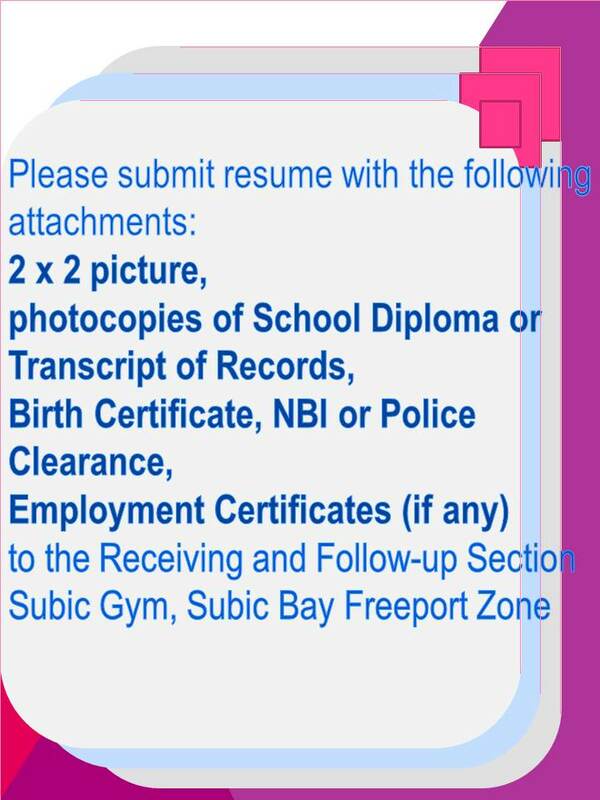 Female; Graduate of BS Nursing (Board Passer is an advantage); Preferably with experience in a manufacturing firm; Can work in a pressure-driven environment; Must be flexible and easy to train. Male / Female; Attentive and flexible; Must possess a good moral character; Honest and trustworthy; Must have experience in the same field. Male / Female; Graduate of Architecture or any related course; With at least 6 mos. of experience in the same field; With good analytical and problem-solving skills; Can work under minimum supervision. Candidate must be a graduate of any 2 to 4 year computer course; With computer-related experience; Keen to details; Willing to undergo training. Male; Must have NCII training in similar field; Must have 3 years working experience specialized in maintenance / repair or any equivalent; Willing to work under pressure; Willing to render overtime (if necessary); Willing to work on Sundays and Holidays. Male; Must have NCII training in similar field; With at least 1 year working experience; Willing to work under pressure. Male / Female; Graduate of any Business or BS in Customs Administration course; With at least 2 years of experience in manufacturing firm; Knowledge in handling import and export; Possess good communication skills both verbal and written; Detail-oriented, organized and resourceful.